I was born and brought up in Milford Haven. 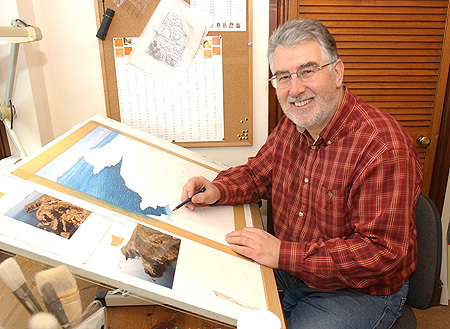 After studying at Cardiff College of Art I worked as a graphic designer, running my own business for 30 years, first in London and from 1976 in Haverfordwest, Pembrokeshire. In 2000 I changed direction, taking up painting seriously. 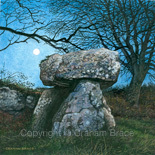 I now work full time as a professional Pembrokeshire artist and illustrator. 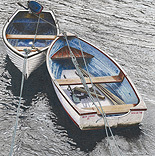 I am a founder member of the United Kingdom Coloured Pencil Society (UKCPS), set up in 2001 to promote coloured pencil as a serious art medium, and although I am very much a mixed media artist, coloured pencil predominates in my work. I have exhibited widely and my work has featured in magazines such as Artists & Illustrators, Pratique des Arts (France), The Artist, Welsh Coastal Life, Pembrokeshire Life, Talking Point (UKCPS magazine) and in instruction books - The Coloured Pencil Artist's Drawing Bible and The Landscape Artist's Drawing Bible (published by Quarto/ Search Press). My work has also appeared on packaging and promotional material for Derwent Pencils and on many websites across the world. I live and work in the waterside village of Llangwm alongside the Daugleddau Estuary. My immediate surroundings and the spectacular Pembrokeshire coast and countryside provide me with endless subject matter, inspiration and ideas. Much of my output is privately commissioned. Recently, I have undertaken major illustration projects for the Pembrokeshire Coast National Park Authority, Pembrokeshire County Council and the Vale of Glamorgan Council - mainly relating to heritage, wildlife and environmental interpretation schemes and publications.